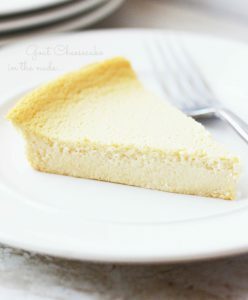 Plain Goat Cheesecake – Just in time for Shavuot! Grain & Gluten Free, Cow Dairy Free, Refined Sugar Free … & Healthy! Our many thanks to Rachael Abel of Love Yourself Green for allowing us to share her cheesecake recipe. This rich and creamy 4 ingredient Goat Cheesecake is completely guilt-free and is made very quickly in the blender! Remember that it needs to chill in the fridge for at least 5 hours. Preheat oven to 350 degrees Fahrenheit /175 deg Celsius. Place eggs in a blender and blend on high for 1-2 minutes, or until frothy. Add remaining ingredients and blend on high until the mixture is smooth. Pour into an un-greased glass pie plate and bake for 35-40 minutes, or until the edges are lightly browned. Let cool on the counter for about an hour, then place the cheesecake (covered or not) in the fridge to chill and become firm for at least 5 hours – preferably overnight. Note: Expect the cheesecake to “fall” shortly after coming out of the oven. *I’ve tried this recipe with ⅓ cup, ½ cup and ⅔ cup of raw honey – I got the best texture from using ⅔ cup honey, but I prefer the sweetness of ½ cup of honey for my own personal sweetness preferences – although they’re all good. ½ cup is the amount I used for these photos if that gives you an idea. This entry was posted in Uncategorized by Cindy Lou. Bookmark the permalink.